Dr Craig Venter, a leading US scientist in synthetic biology, talked on a panel yesterday at the LSE. As someone who dominates this area of scientific practice and a controversial figure I have inadvertently followed in my research, I jumped at the chance to hear him speak. Also on the panel who gave further insights into ethical, philosophical and practical issues were, Prof. Sarah Franklin (LSE), Prof. Peter Lipton, Dr Chris Mason (UCL) and Prof George Gaskell (LSE). Venter who founded the J. Craig Venter Institute, has hit the headlines recently with his proposal to design a completely new life-form. Through his institute he famously pushed the mapping of the human genome, in fact he is amongst only two people who have had their genome sequenced, the other being James Watson (co-discoverer of DNA structure). Building on this research he now has bigger sights. He interestingly wants to gain comet samples to sequence bacteria found on the rock, to illustrate the transpermia taking place across the solar system. The Institute researches areas including Human Genomic Medicine, Environmental Genomics, Synthetic Biology and Biological Energy. Actual outcomes include sequencing bacteria and microbes in the Sargasso Sea to find tens of thousands of new microbal species and tens of millions of new genes. Also constructing whole new artificial chromosomes. These can in the future create new microbes and biofuels that through microbal metabolism eliminate carbon dioxide (CO2) output into the environment and capture back current CO2 in the atmosphere . Venter talked about the process of creating new synthetic chromosomes to establish the needs and importance of each gene. He used the metaphor of electronics to explain the processes behind the production methods. “Using new methods the group improved the speed and accuracy of genomic synthesis by assembling the 5,386 base pair bacteriophage φX174 (phi X)”. 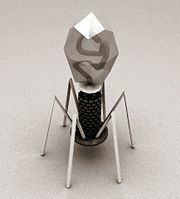 Here the software ‘bacteriophage’ is used like software to create and synthesis the hardware, to build the phi X 174 genome. More to come on Venter’s talk and misuse and ethical implications. Yesterday was the launch of Foresight‘s (Government Office for Science) Tackling Obesities report at the RSA , London. The report was the culmination of two years research and investigation into a future obesity epidemic. Over the summer of 2006 I worked as an intern, alongside Jessica Charlesworth, to help Foresight vision the impact of the predicted obesity epidemic over the next 50 years. I am personally fascinated by the evolution of human physiology and behavior according to our desires, changing self-perceptions, scientific and technological developments – so it was great to have access to Foresights extensive research and insight into our obesity future. Some highlights of our work with foresight can be found on my website and at Jess’ blog. The findings of the report are already hitting the press, with more attention to ‘passive obesity’ and the ecological perspective of influences fueling this epidemic. Here, an obesogenic environment includes our built environment, energy-density foods, grazing, lower levels of physical activity, stress, genetics, media and food advertising. What’s more we are biologically hard-wired to prepare for famine and store energy in the form of fat as an evolutionary survival mechanism. Our work considered the evolution of the body in response to an overtly obesogenic environment and some proposals for tackling the problem. Our project aims to be a point of provocation informed by Foresight’s extensive consultation with leading world scientists, experts and other stakeholders in order to stimulate debate in Government as well as the general public.